Sometimes Tag Manager is so easy it feels like cheating. In a good way. 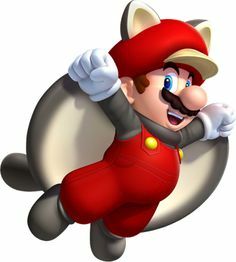 Like getting a super acorn power-up and turning into Flying Squirrel Mario. Recently I used my flying squirrel powers to beat the dynamic content boss. My client wanted to track how visitors used a couple different search forms, each with multiple options. Every time an option was selected, new search results would appear dynamically and a parameter would be added to the URL hash. For example, if the visitor chose to view all the seminars on day 1, the URL would become /seminarsearch#day=1. Search those seminars by topic X and the URL would change to /seminarsearch#day=1&topic=x. Or it might be a different search form, say for vendors, and the URL might look like /vendorsearch#category=abc&location=bldg2. How was I going to tackle all those moving parts and get the data I needed into Google Analytics? I wrote a couple different pieces of code that were unsatisfactory for one reason or another. And then I found my super acorn. Deceptively simple! Don’t worry about listening for clicks and trying to identify if they’re the clicks I’m interested in. Just detect when the hash changes and send an event to the data layer. This tag fires on every search form page. The scroll tracking tag fires either after the window loads or when the hash changes, with a simple revision of the rule from "event equals hashchange" to "event matches RegEx gtm.load|hashchange". That way I don't have to wait for the visitor to click any options, in case they start scrolling through the default content (featured seminars or vendors). And then finally I have tags that fire when the scroll tracking tag pushes events to the data layer. 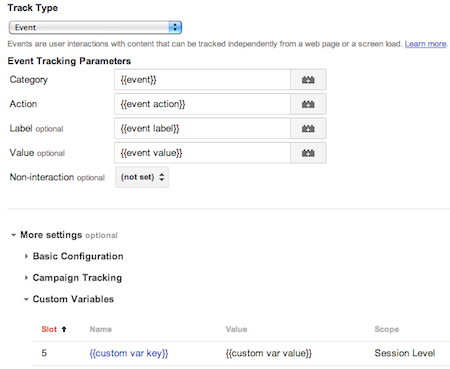 These tags send my events and custom variables to Google Analytics. Remember: to make sure your custom variable info is not just set, but also sent, hitch it to an event. Tag Manager makes it easy with the options under "More Settings" as shown above. Has dynamic content made it more difficult to get the data you need to answer important questions? How have you tackled it? Please share in the comments.